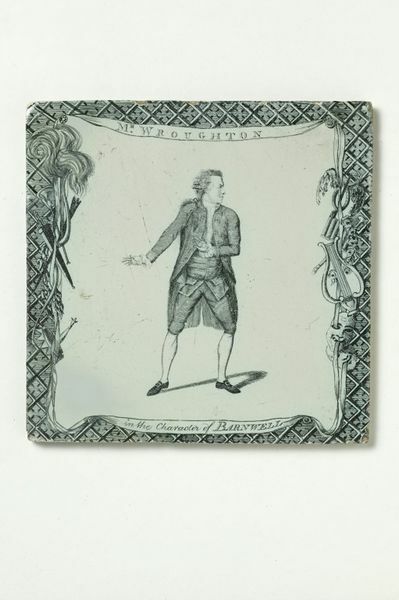 This tile, showing Richard Wroughton (1748-1822) as George Barnwell in The London Merchant, or the History of George Barnwell by George Lillo, is one of a series of late 18th-century tiles of actors and actresses produced in Liverpool by John Sadler (1720-1789). 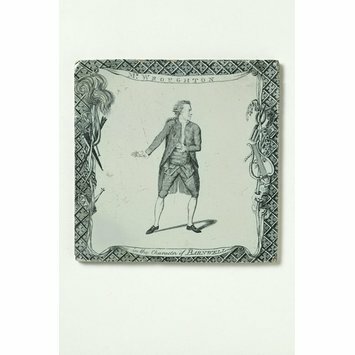 Sadler experimented with transfer-printing on white glazed delftware tiles, transferring images from engraved copper plates to tiles, using enamel colours fixed in low-temperature firing. Actors and actresses could become big stars in the18th century, when theatres, concert halls and pleasure gardens were the major forms of public entertainment. Engravers regularly produced images of paintings of the most popular performers, so the ability to reproduce engravings on ceramics was a lucrative development. Since the engravings were transfer-printed, the original images appear on the tiles in reverse. Richard Wroughton was born in Bath and very quickly made his name after his first stage appearance at Covent Garden Theatre in 1768. That season he was cast in eight other roles at Covent Garden, including the role of George Barnwell and Malcolm in Macbeth, and by 1786 was earning the large salary of £12 a week. He spent 37 years working on the London stage as an actor and a manager and became a trusted and respected member of the profession. Square glazed cream earthenware tile, transfer-printed with a decorative border of trellis work, and symbolic theatrical objects on the right and left sides including a flaming torch, comedy and tragedy masks, and a lyre. There is a central image of Richard Wroughton as Barnwell, standing, wearing knee-length breeches, a waistcoat and a cutaway coat, looking to his left. In a ribbon ground above his head is the name: 'MR WROUGHTON', and below: 'in the character of BARNWELL'. Decoration in underglaze blue-black colour. A Biographical Dictionary of Actors, Actresses, Musicians, Dancers, Managers and other Stage Personnel in London, 1660-1800, vol. 16. Published by Southern Illinois University Press, 1993. The image is taken from the engraving by T. Cook after the painting by James Roberts published as a plate to Bell's British Theatre, 1776.